Locally made, professional grade dry ice for superior cooling, cleaning and dry ice blasting without water and with ZERO residue. St. Cloud, MN, October 8, 2018 — St. Cloud, MN (October 8, 2018) – Central McGowan, a trusted supplier of gases and state-of-the-art equipment/technology for the manufacturing, welding, medical, and food and beverage industries in the upper Midwest, announced its expansion into the solid carbon dioxide (CO2) or dry ice business with its launch of ColdZERO™—a line of professional grade, locally made dry ice. 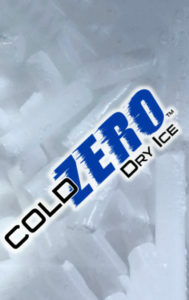 ColdZERO is made using the newest dry ice technology from Cold Jet®, a leading global supplier of high-capacity, quality dry ice production equipment. According to Dean Boese, who heads up the CO2 distribution business at Central McGowan, this new technology provides the highest density dry ice rice available—making it superior to sand, soda, water, solvents/chemicals, or power/hand tools in terms of cleaning performance, efficacy, efficiency and ease of use (see sidebar below for advantages). Pound for pound, it offers far more refrigeration power than water ice, and is made fresh daily to order for maximum shelf life and cooling/blasting power. Plus, the CO2 used is a by-product of other manufacturing processes, making it a carbon-neutral, sustainable cooling and cleaning medium. “We’re really excited to add ColdZERO to our list of gas offerings due to its wide array of uses,” said Boese. “It’s used in more than 20 different industries.” Applications include everything from industrial cleaning and dry ice blasting to medical manufacturing to food processing and equipment cleaning to things like wood finishing, mold remediation and historic restoration. Plus, it works for preserving food, fish and game and providing emergency refrigeration during power outages. “What’s best is that it does its job and then changes directly from a solid to a gas—leaving behind no secondary waste, residue or watery mess,” he added. Dry ice is the common name for the solid form of CO2. It’s called dry ice because it sublimates instead of melting, which means it goes from a solid directly to a gaseous state. It’s made by compressing and cooling CO2 until it liquifies. Once it liquifies, the pressure is reduced which causes some of the CO2 to vaporize resulting in a drastic drop in temperature. This causes the liquid to freeze, creating CO2 “snow” (CO2 freezes at -109.3°F or -78.5° C). The “snow” is then hydraulically pressed into dry ice blocks, or formed into nuggets and rice by extruding it through special dies. • Rice (approx. 1/8 -inch pellets). Central McGowan offers same-day, convenient delivery and pickup for larger orders which are sold in returnable, rolling insulated totes. Products are volume-priced, so the more customers buy the better the price. Totes are lined with plastic to ensure purity and hold about 500 lbs. Consumers can buy ColdZERO in brown paper, double-walled dry ice bags at the company’s retail stores for $1.50/lb. “Whether you’re a professional dry ice blasting company, a food processor in need of emergency cooling, or a teacher simply needing dry ice for a science project, we can supply you with a professional grade, locally made, high-quality source that’s competitively priced,” concluded Boese. For more information, visit the Dry Ice page of the company’s website or call any of the company’s three retail stores and ask to speak to its dry ice specialist. Provides quicker clean-up and less risk of packaging damage and product contamination as there is no secondary residues or the introduction of water into the process. About Dry Ice Safety / Dry ice is safe to use when handled properly. It is extremely cold -109.3°F (-78.5°C) and should not be touched with unprotected skin as this could cause freeze burns or even frostbite. It should be kept and stored in well-ventilated areas and containers that are not air-tight. It should never be ingested or used in drinks or beverages, and kept out of the reach of children and animals.